As is my custom for these trip reports, I use small photos in the story and links to larger versions if you want to see more detail. I didn't put a lot of planning into it, but I thought I could get away for a few hours for a ride Saturday morning. The weather prediction was for the hottest day of the year so far (110 degrees predicted), and potentially the hottest day we would get all season. I only had two goals: (1) find the Foresthill off road vehicle area and (2) try to get back before noon so that I wouldn't spend too much time riding in the heat. Half way through the ride I did one of the dumbest things I've done in a long time. First off, I decided to take my good camera to get better photos, rather than my pocket camera, and store it in the right hard bag. 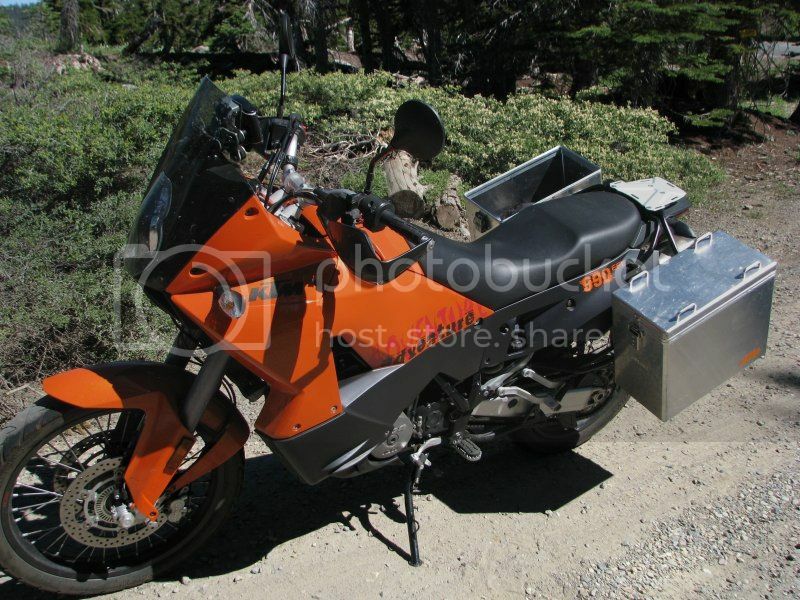 Then I noticed that the bike doesn't look as good in the photos with a bunch of stuff piled on it, so I kept my helmet with me and put the lid back on the hard bag where the camera is kept when taking photos. 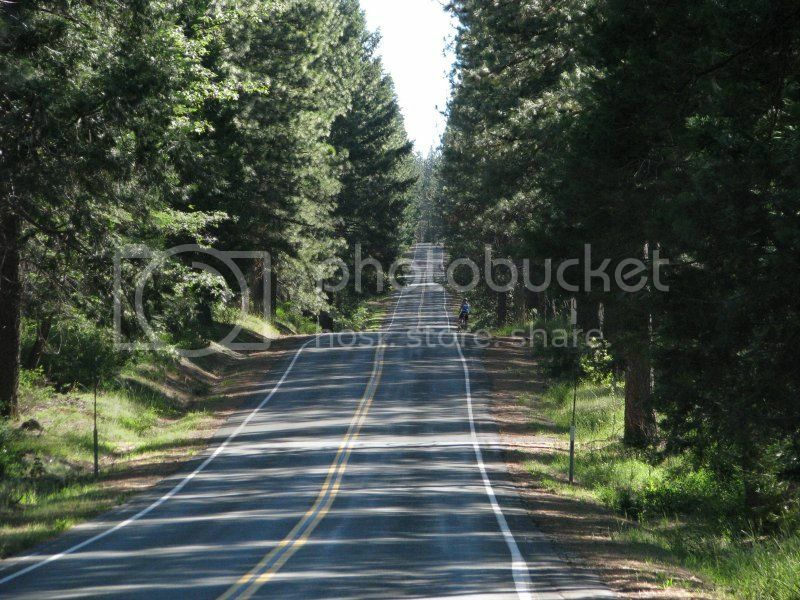 I then decided that there was too much good scenery, so I would just stick the camera around my neck for a bit while stopping every quarter mile. So I got to the end of Foresthill road and decide to stick the camera back in the hard bag for the rest of the ride and "Whoa! Where's the lid?" I had gotten into the habit of not locking the lid in place when I was going to open it again before going on, so somehow I had managed to leave it like that when I decided to put the camera around my neck. I knew which stop I had made when I still had the lid, so rode slowly back down the road looking for the aluminum lid. Before turning around after discovering my loss, there was NOBODY on the road all the way up from the town to the end. Heading back in search of the lid, I passed two or three cars and a guy on a green Kawasaki KLX400, who I waved down to ask if he had seen the lid. He had not. I didn't see anything all the way down to the point where I knew I still had it, so I headed back up the road a bit slower this time, looking more at the side. Heading back up, I remembered hearing the lid fly off and hit, but I had though it was my camera bumping something and didn't remember where I was when that happened. It seems that I need to pay more attention to strange sounds. About half way back I spotted the lid and the guy on the Kawasaki had seen it too, had stopped, and was going to pick it up, but I got there first. And wouldn't you know it? Of the two or three cars passing through there that day, one managed to run over it and smash it beyond repair. When I go riding in areas that I'm not totally familiar with, I keep thinking that I should bring along a map of the area, since I can't really figure out where the roads go by using my Garmin GPS. And once again, I didn't bring any maps with me. I had looked at Google Maps to find out where the Foresthill staging area was at and sort of remembered Sugar Pine Rd as the one to take to get there. I kept riding east out of the town of Foresthill not knowing if I had missed the turnoff or not. Eventually I passed a nice sign that very clearly pointed to it, so I got there without any detours or U-turns. 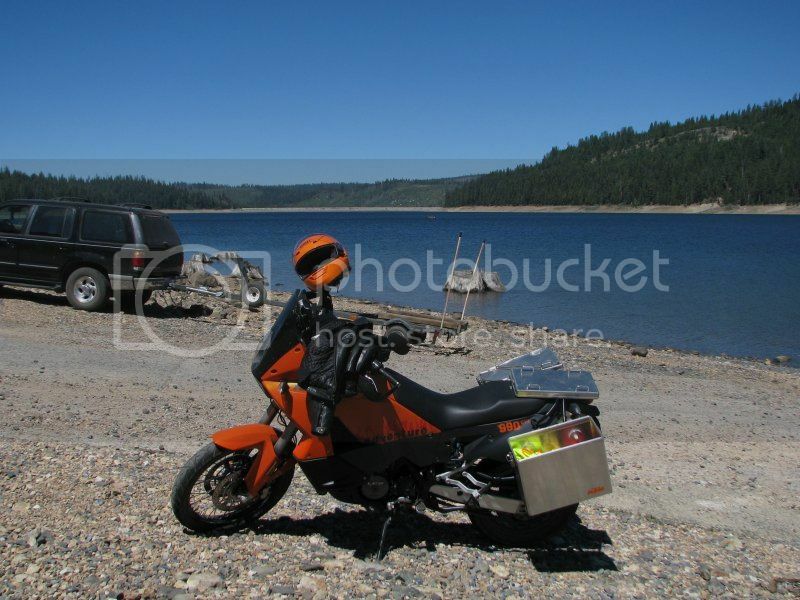 It's definitely a place for a bike like my XR650L and not the big KTM. I noted that it was 55 miles from my house, while Georgetown is about 45 miles away. Both are quite a long ride for some good trail riding. 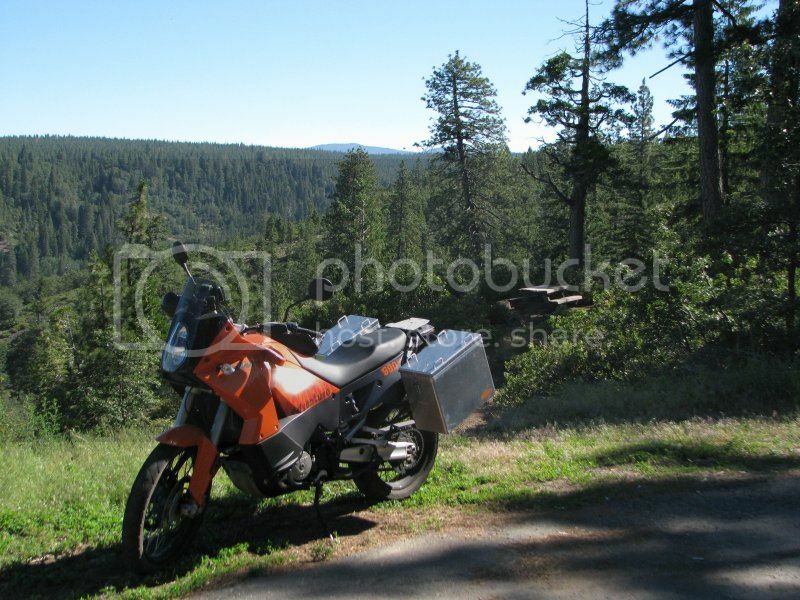 But I don't want to own a truck or trailer to haul motorcycles, so long rides before and after riding the good trails are what I end up with. Every time that I get up in the hills like this I'm reminded that I need to do it more often. Why do I spend so much time working and taking care of home and family when I could be out riding in the mountains? Sometimes I wish I wasn't such a responsible adult. 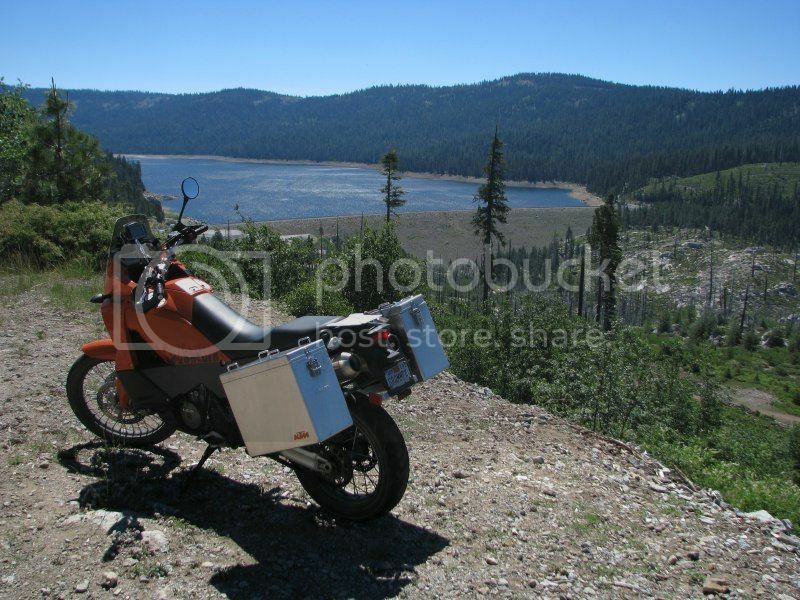 After finding the OHV staging area, I decided to go have a look at Sugar Pine Reservoir. That's when I realized that I had been there before several times. 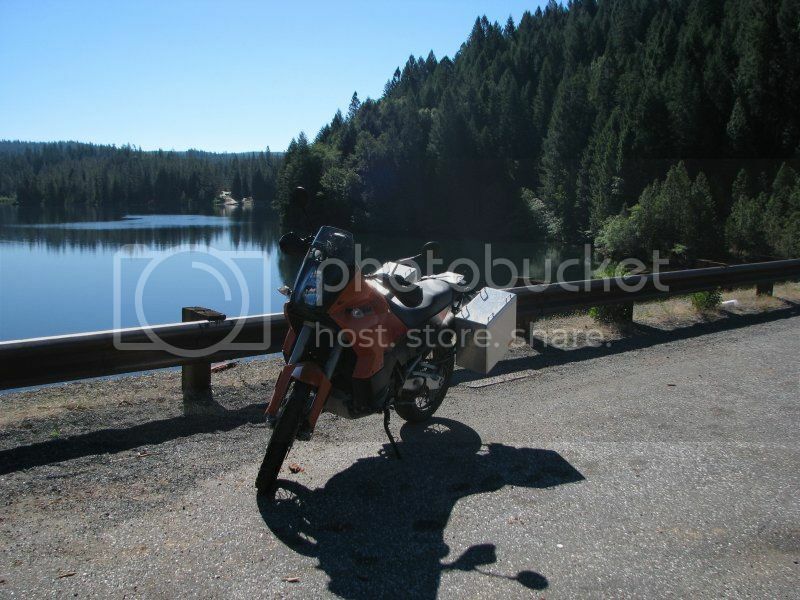 Someone gave me a dirt road route through the area and one of the paved sections goes right past Sugar Pine Reservoir. Now I have a bit better feel for where all of these roads are relative to each other. Heading east on Foresthill road was all new to me. I had never been beyond the town of Foresthill on that road before. 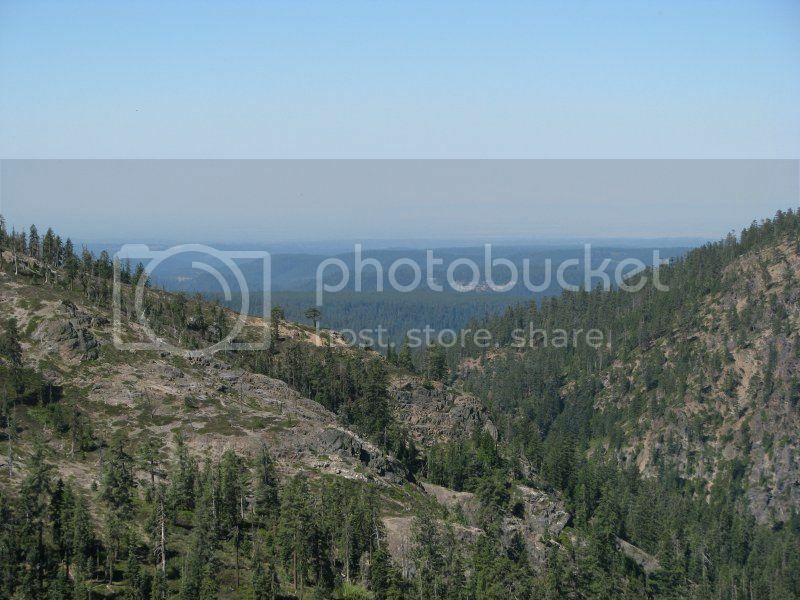 It has a nice variety of mountain scenery with some densely wooded areas, a few sections where forest fires have left empty poles, some great views along the tops of the ridges, and some steep hillsides. Towards the east end I was thinking that if somehow I managed to tip the bike down the hillside, it would be an awful lot of work getting it back up again. 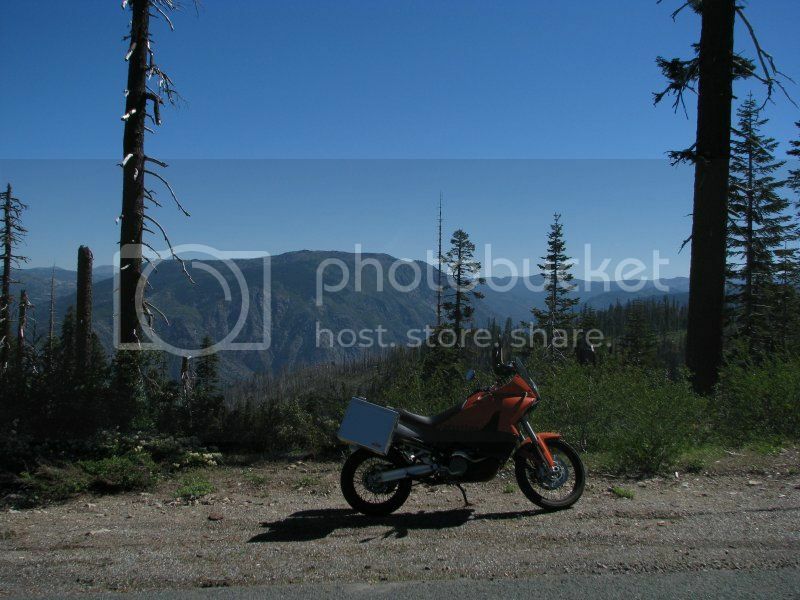 Since I don't always make the wisest decisions, especially when riding a motorcycle, I stopped at the edge of one steep section to get a photo. I checked about three times that the bike couldn't accidentally fall to the right as I got off, because it was almost straight up when on the sidestand. 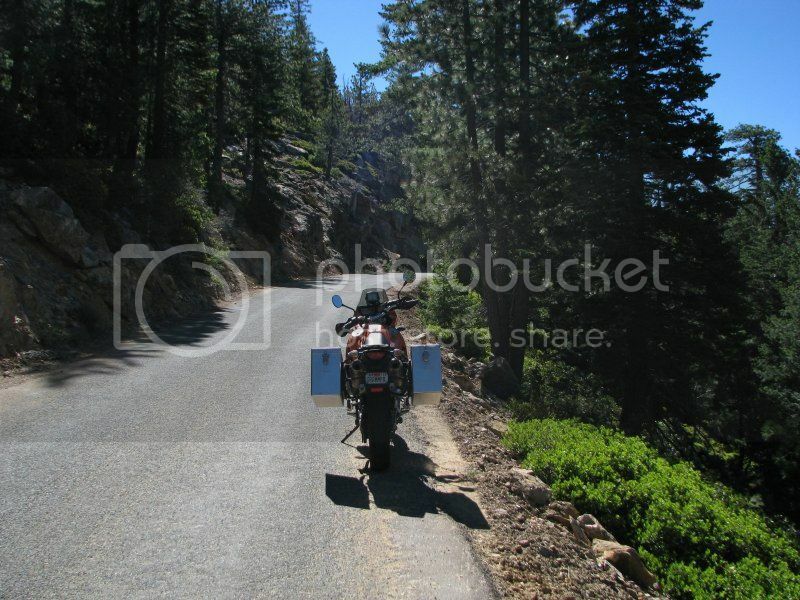 There were several miles with steep drop offs like this. I had remembered from looking at the map, that there was a road somewhere off of Foresthill headed to French Meadows Reservoir, which I've been to several times. It turns out that the road headed there is right at the end of Foresthill Rd. You come to a T-intersection there and the sign says that French Meadows is in BOTH directions. I chose the shorter one, but next time I'm taking the other route. Just after making the right turn onto Robinson Flat Road was when I noticed the cover to my hard bag was missing and had to go back and find it. Once I had made it back and the lid was "secured", I headed off down a gravel road, not knowing how far until pavement again. 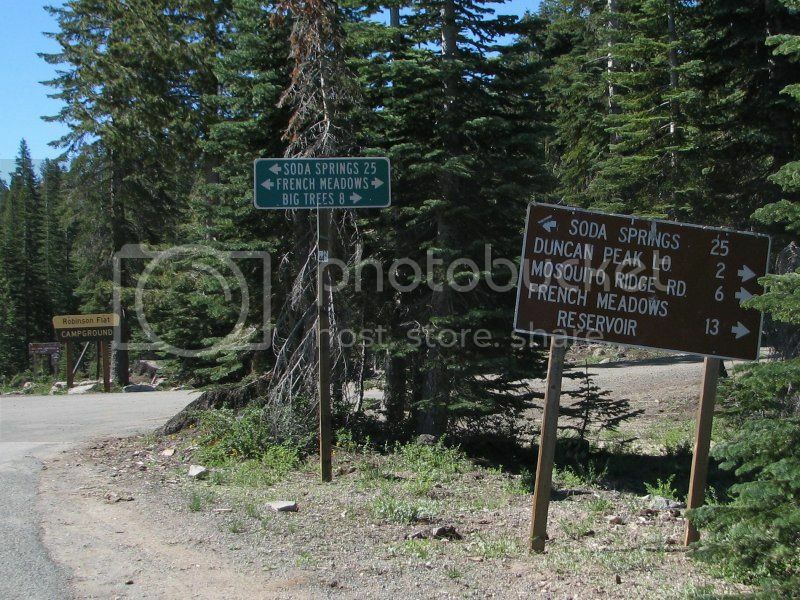 (If I had paid attention to the signs I would have known 6 miles to Mosquito Ridge Road, 13 to French Meadows.) I was wondering if maybe I should let some air out of the tires, because the bike was wandering all over the place on the gravel. I left the air alone and pretty soon I had adjusted to the different behavior. After a mile or two the road headed down and that's when I remembered that I needed to turn off the ABS. For some reason it took me five or six tries to get it to shut off. When it's on and you use the brakes on a gravel road while heading downhill, the ABS kicks in way too much and only gives you about 20% of what braking should be available. I eventually came up with the right combination of turning the bike off, restarting it, and holding the ABS button down to turn it off, but it was quite annoying by about the third attempt to find that it was still keeping me from being able to brake properly. Any stops for photos while on that road were made with the bike still running so that I didn't have to hassle with trying to shut off the ABS again. 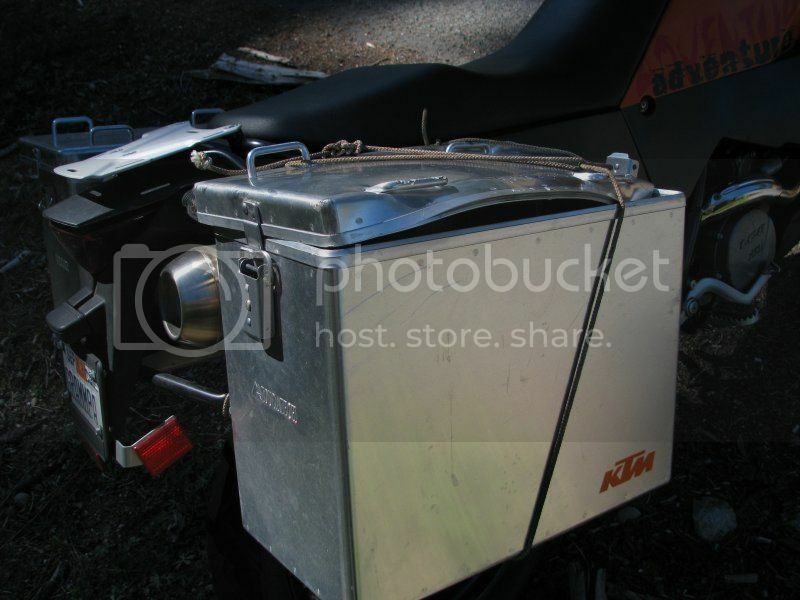 I can see why some KTM owners wire in a separate switch that can kill the ABS function. Once I made it to French Meadows Reservoir, I had this beautiful view. From there on I knew the route back. I first wanted to find some water to clear the bugs off of my helmet visor. That's when I fell off of the bike. It was actually parked at the time, but for some reason when getting off in the gravel I caught my boot on the hard bags and fell right onto my backside. Good thing I had on my leather pants. Notice all of the stuff piled on the bike this time. The most direct route from French Meadows Reservoir to the town of Foresthill is on Mosquito Ridge Road, which is about 35 miles of twisty mountain road. In other words, it's a wonderful road for a rider like me who enjoys that sort of thing. The temperature had been nice for the entire ride until about ten miles out from the reservoir. Once I dropped about a thousand feet in altitude it suddenly started feeling hot and stayed that way for the entire rest of the trip. At about the half-way point I saw four riders at a turnout who looked like they were about ready to head out. Two were on supermotos and two on older sport bikes. Since it looked to me like they were likely to want to ride a bit faster than I wanted to ride, I stopped to ask them if they were leaving soon and let them go ahead of me, so that I wouldn't have them all trying to pass on an interesting part of the road. After they took off, the supermotos soon disappeared down the road and the other two weren't really going any faster than my normal pace. A couple of times we caught up to the supermotos who would occasionally stop and wait for the rest of their group. Once the road started heading back uphill for a bit rather than down, the two riders in the back switched places and were soon going faster than I felt comfortable riding. I'm big on "ride your own ride" and all that, but I found myself pushing it just a tiny bit to see if those guys ahead of me were really running a faster pace than felt comfortable for me. Yep, they were, so I backed off a bit and continued at a slightly safer pace. About half a mile from the town of Foresthill I finally caught the bikes, but I soon figured out that they were stuck behind a van that had hauled rafts for whitewater rafting, and it was stuck behind a car that was even slower. 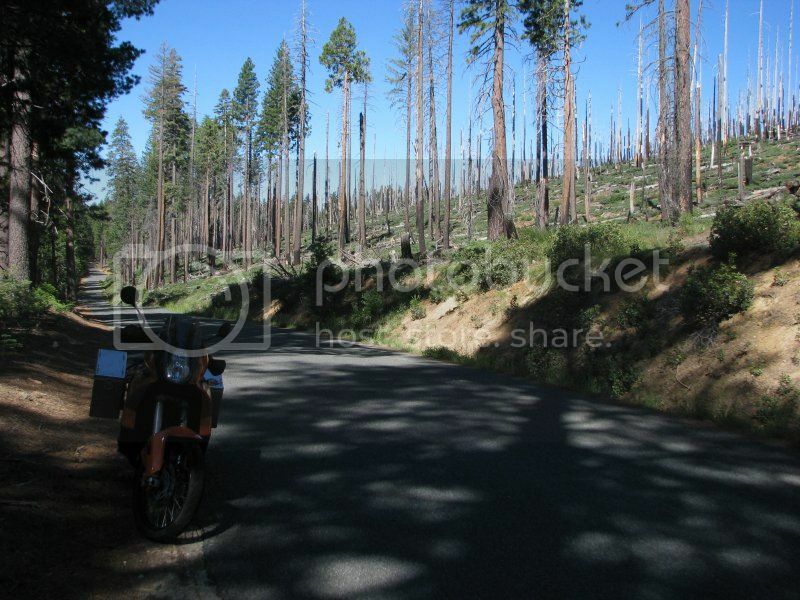 Once at Foresthill Road, the bikes cut through a parking lot to avoid having to wait for the van to turn, so that they could head back toward Sacramento, while I turned the other way to see if the town of Foresthill had anywhere interesting to eat. The Red Dirt Saloon looked "interesting", so I stopped there. The back of the building is actually the Ore Cart Steakhouse, which is where I had lunch. They had a good air-conditioner in there and I ordered fish and chips, which was quite good. I expected to be able to detect some signs of partial dehydration, but I didn't really drink any more water than I otherwise would have. It was clear that I had missed my goal of making it back home before noon, since it was about 12:15 when I began lunch. I got completely cooled off during lunch before heading back out, and did something that I don't normally do - I got fully geared up in the shade at the entrance to the saloon so that I wouldn't be spending much time in the sun before getting underway. One thing I forgot was to insert my earplugs, which soon became obvious after leaving the 30 mph zone of downtown Foresthill. I should have figured it out as I was filling the tank with gas at the only gas station in town, but I didn't until the speed picked up. I stopped in some shade along the side of the road and put the earplugs in for the rest of the trip. Nothing else worth reporting for the remaining hour of the ride back to my house in Folsom. It was hot all the way, but the airflow combined with a bit of perspiration kept me from feeling too hot. I had to pay attention a bit more to the "tar snakes" on some of the roads, because they can make the bike wiggle a bit, but I didn't really have any issues with them. Down where Old Foresthill Road connects to Highway 49 I saw a forest fire that had just started. I don't think I would enjoy being a fire fighter when the temperature is over 100 degrees before you even get near the fire. This one wasn't too big yet and already had both an airplane and a helicopter dropping water on it. Fortunately it was far enough from the roads I was on to not significantly affect traffic, although I saw quite a few people stopped along the road, on the other side, watching the fire get put out. I didn't see the point in stopping in full leathers to watch any of it in the hot weather. I made it home about 1:30 and was glad to have a good air-conditioner in my house. It felt good to get out of the leather riding suit and sit under a ceiling fan for a while. Total mileage for this trip was 187, and I was gone close to 6 hours. Next time when it is likely to be hot when I get back, I'll try to leave about 6:00 a.m. to miss a bit more heat. As it was, the heat wasn't a serious issue, because I was only hot for maybe an hour and a half of the total ride.